UPDATE: In all, three were arrested after a Sheriff's Office vehicle struck and disabled their car. Three people were arrested after they got out of a disabled car and ran from deputies Wednesday morning, Jan. 16, in a rural area south of Hillsboro, officials said. 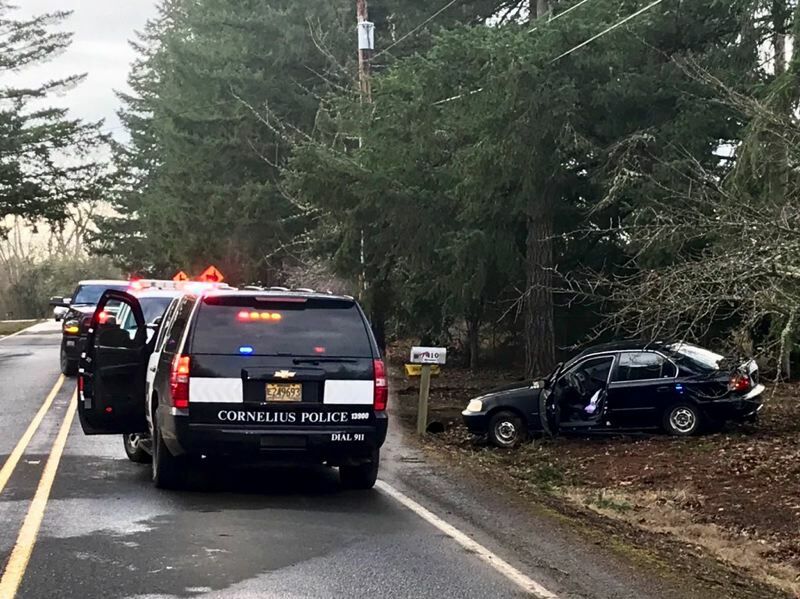 Estella Caballero, 22, of Forest Grove, is facing charges of eluding in a vehicle, eluding on foot, driving while criminally revoked and a felony probation violation, according to the Washington County Sheriff's Office. Her boyfriend, 19-year-old Jorge Gandarilla of Aloha, is facing charges of methamphetamine possession and a felony probation violation. The car's third occupant, 24-year-old Aloha resident Dalton Tate, is also facing a felony probation violation charge. Sheriff's deputies said they tried to pull over a 1990 Honda Accord with no plates in the 5000 block of Southwest Hillsboro Highway, at about 7:43 a.m. Wednesday. The vehicle did not stop, instead turning onto Southwest Burkhalter Road, then allegedly running a stop sign and turning northbound onto Southwest Minter Bridge Road. Deputies ultimately performed what is known as a pursuit intervention technique, better known as a PIT maneuver, in which a law enforcement vehicle deliberately rams the suspect vehicle with the intent of disabling it, to stop the car in the 7400 block of Minter Bridge Road. The three occupants got out and fled from the disabled car, the Sheriff's Office said. The two passengers, Gandarilla and Tate, were caught right away and taken into custody, but Caballero, the driver, got away, according to deputies. Officials set up a perimeter, and Beaverton Police Department K-9 officers were called in to help. Farmington View Elementary School, which is located near the area at 8300 Southwest Hillsboro Highway, was also placed on lockout as a precautionary measure. Caballero was found just over five hours later walking in the same area where the Honda had been stopped, according to deputies. The Sheriff's Office said she was transported to the hospital for symptoms of exposure, then booked at the Washington County Jail later Wednesday following treatment. Deputies said they found objects inside the Honda that had been reported stolen overnight. The items were returned to their owner. Editor's note: An earlier version of this story originally appeared on the website of KOIN 6 News, a Pamplin Media Group news partner. This story has been updated with more information on the pursuit, lockout at a nearby school and name of the third suspect.